Have you ever tried to use a lawnmower as a dishwasher? Yea, doesn’t really work that well. You know, you put the dishes into the lawnmower and you turn the lawnmower on and things go bad pretty quickly. You see, certain things have a certain purpose. And when we use something that has a certain purpose for something else, things tend to go wrong pretty quickly. Human beings . . . You know, our God'sa God of purpose, He does things on purpose, with purpose, for purpose. He's not, "Sort of a . . . just do this, we'll just do that." No, he's a God of purpose. And he created human beings for a purpose, with a purpose and, and working that out, working out who you are, as a human being, and we all share that, who you are individually, is really, really important to living life to the fullest, to experiencing, I mean, the incredible joy that God wants to fill our lives with. One of the things I think most people can spend their whole lives ignoring or their whole lives and never really discover, is that human beings are made for mission. You and me, we’re made for mission. We’re not made to be served. We're made to serve. And when we ignore that at best, we get frustrated, at worst we become really, really miserable You know? Because any time you use something for something that it wasn't intended for something wasn't created for, then it's like using a lawnmower as your dishwasher. It just isn't gonna work. So you’re made for mission. You’re made for mission and, and what does that mean? it means that God has placed you on this earth for some specific reason, for some specific mission, and he wants you to carry out that mission. And I think when we think of that, we think, "Whoa, that's heavy, that’s big. How am I gonna work that out?" You work it out little by little. You work it out by taking the step that's in front of you today. You work it out by realizing, "OK, how can I serve other people today?" Even in small ways. And the more we serve other people, the more our mission becomes clearer to us. And sometimes we'll, we'll spend a year doing something or three years doing something, and we might even think that's our mission. And then God will pull our life in a completely different direction. Ten years later we realize, "Oh, God had me doing that other thing, 'cause he was preparing me through that, for this other mission over here. That's how God works sometimes. Just take the next right step. Just do the next thing that you can do to serve other people. You see, what I know for absolute certain, is that when we get all caught up in ourselves, we turn inward, things go bad pretty quickly. There's not much joy in that. There's not the . . . we don't find the happiness that God created for us in that. 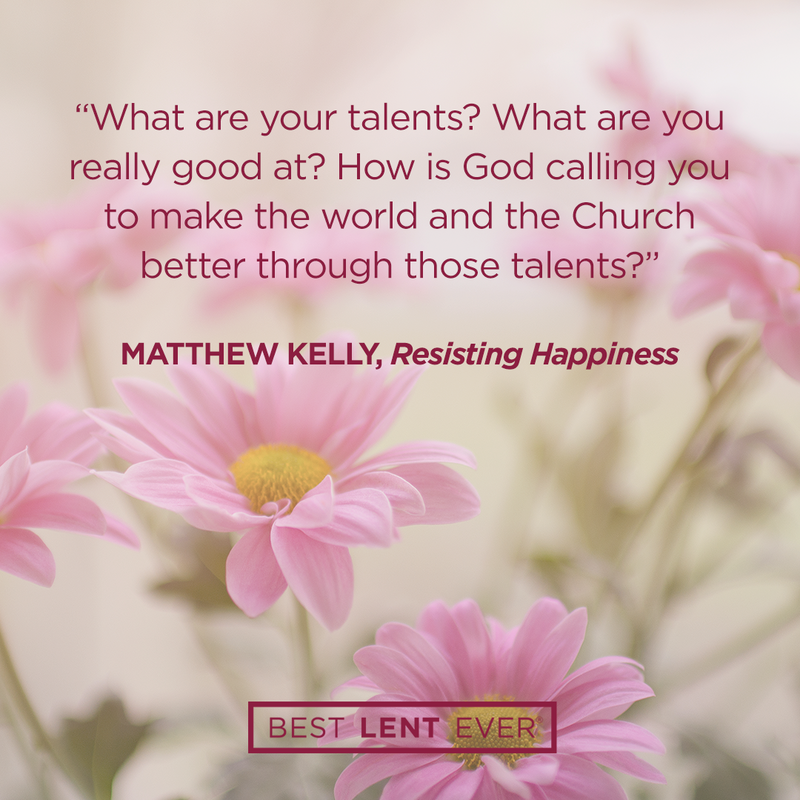 We find that happiness, we find that joy, by turning outward toward others and asking ourselves, "How can I serve the people around me powerfully today?" Because we’re made for mission. And the more we serve the people around us powerfully, the clearer that great mission God created us for will become. You cannot be happy focused on yourself. You were made for mission. It's deep within you. Only by serving others in a meaningful way do we truly discover the happiness we yearn for so unrelentingly. What mission do you think God is calling you to now in your life? Don't get caught up in what he might have been calling you to in the past, or what he might call you to in the future. Just write down his invitation to you today as you can best discern it. God, I want to serve you powerfully. Which talent do you want me to focus on at this time in my life? Today’s personal reflection features Dynamic Catholic team member Jennifer Rey. Jennifer is our web content team leader. She comes to us from Midland, Michigan. Jennifer enjoys quilting, has only two stops left on Kentucky’s Bourbon Trail, and hopes to someday win Dynamic Catholic’s Fantasy Football league. What mission do you think God is calling you to now in your life?